The larger sets in this wave have obviously been built around a large play feature somewhat to the detriment of appearance, especially the Fire sets. This might not be how adults would like to see them but it certainly makes them exciting to play with. I’ll talk about how this affects this set a bit more later on. Before I get into the nitty gritty of the review I’d like to indulge myself a little and let you know why Legends of Chima is a line I’m particularly interested in, and hopefully pass on some behind the scenes information you might find interesting. Early in 2011 I got an email from Adrian ‘Olog’ Florea. 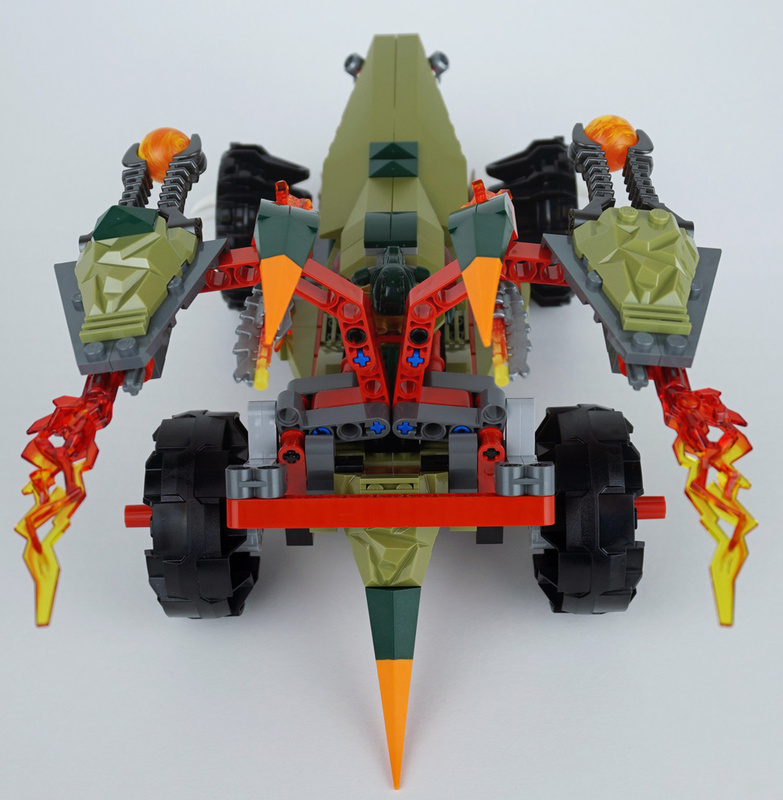 Famous for his MOCs as an AFOL, he had recently become a LEGO Designer and had been tasked with recruiting four AFOLs to take part in a development workshop. How could I say no? In what seemed like no time at all I was on a flight to Billund, the holy ground of LEGO HQ. Once there I met up with the other three AFOLs and we soon started speculating about what we were going to be doing and just how excited we were to be doing it. 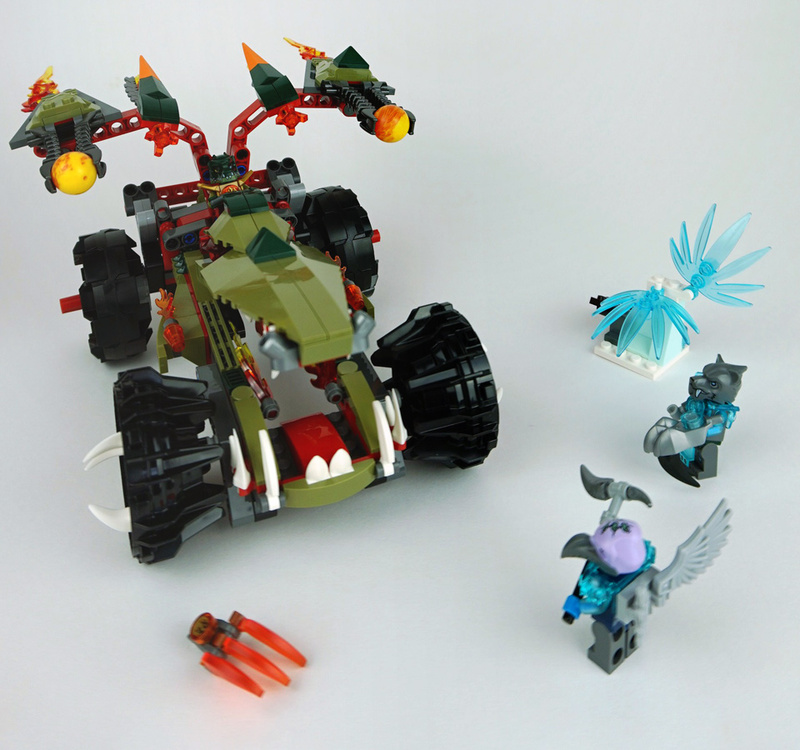 After a brief introduction to the ‘fuzzy front end’ team that we were working with we were shown some artwork based around minifig animals, their tribes and vehicles, castles in the sky and power crystals. Animals riding animal-shaped machines fighting each other for energy? We could work with that! The next three days were each filled with 12 hours of building and lots of discoveries. We worked together as a team, helping each other out, so many of the models created were collaborations. Legends of Chima was still very much in development at this time; the idea of Chi was there and I remember making lists of which animals should be good or evil but we were mostly there to build. Of course LEGO Designers were there as well but I think us AFOLs were drafted in to help get new and different ideas flowing. We were encouraged to cut and spray elements which felt very wrong at first but I soon got into it. I saw stuff I still can’t reveal but most things have been released by now. 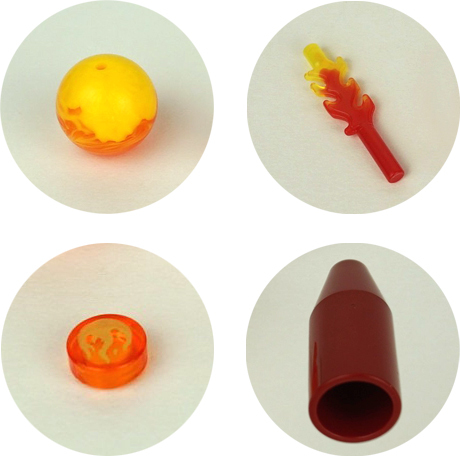 Resin versions of the ball and socket joints that would eventually end up in the Legend Beasts struck me as having all sorts of possibilities and I saw Lord of the Rings models before it was known LEGO had the license. There was also a lot of strange and new colours and these weird doll-like minifigs, what could they be? 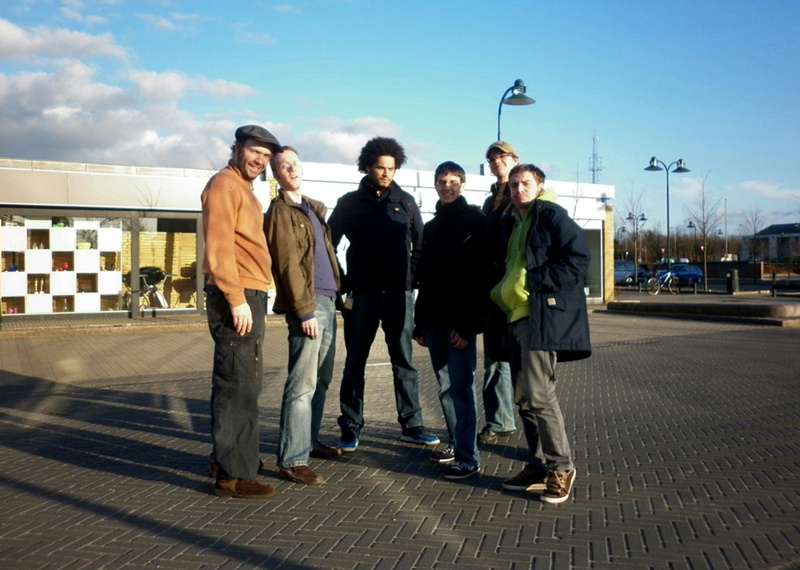 Photo of the Billund 2011 gang. Left to right; Cole Black (AFOL), Tim Goddard (me), Shamisenfred (LEGO Designer and AFOL), Stefan Schindler (AFOL), Tuomas Kukkamaa (AFOL) and Adrian Florea (LEGO Designer and AFOL). Most of the building was done from large sets of drawers on wheels sorted much like an AFOL would have. And then there was the basement. Racks and racks of every brick currently in production, many of which had yet to reach retail. Heaven. I can’t say that anything I built over those three days ended up as a set but I’ve definitely seen hints of some of the things I created particularly in the first two years of release. I’d love to see those models again but of course we could not take any pictures at the time, confidentiality was strictly enforced. But I should really talk about the set I’m reviewing. To sum up, it’s a crocodile wheeled tank which shoots fireballs. 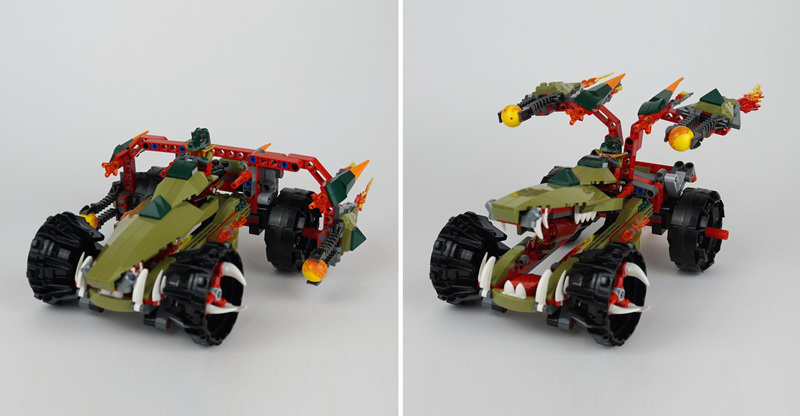 The build is very Technic-heavy as everything is designed around the ‘Fire Chi Power mode!’ Essentially the model is a hollow rectangle with a wheel on each corner and a lever mechanism that is an impressive piece of LEGO engineering. Pushing the ‘tail’ down opens the mouth and folds up side panels with the ubiquitous projectile launchers. I’m never very keen on building this type of System scale model which is dominated by pins and beams. I guess the reason this type of set doesn't appeal is because it is nothing like how I build; it uses lots of the types of pieces I use only sparingly and is really annoying to take apart again. On the plus side the unfolding mechanism is very strong and works flawlessly every time and to good effect. On the negative side it makes the model look unfinished with exposed colours and beams that take away from the overall look. There are some interesting parts and a few new ones. 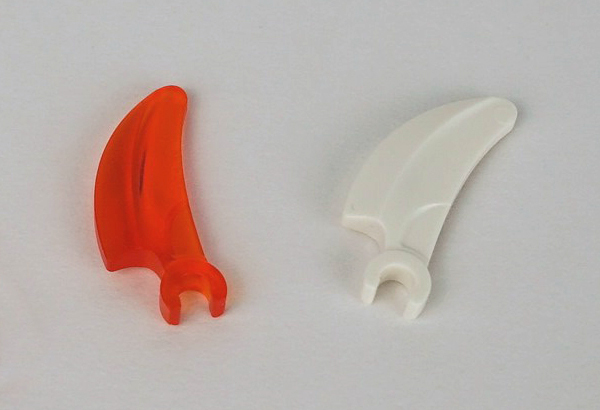 LEGO's recent obsession with claws continues with a new type with a clip: two White ones (Element ID 6072900 | Design ID 16770) are exclusive to this set and there are three Trans-Orange [BL]/Tr. Br. Orange [TLG] versions (Element ID 6070057), which also appear in various other sets just released. If greens are your thing you are in luck. Six Dark Green [BL]/Earth Green [TLG] baby bows (Element ID 6055225 | Design ID 11477) are currently exclusive to the set, as are sixteen 1X2 grille tiles in swamp, sorry, Olive Green (Element ID 6071200 | Design ID 2412). 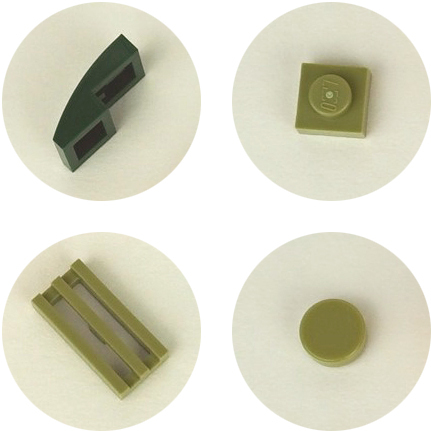 There is a good selection of other Olive Green bits too, including various slopes and basic plates like four 1X1 plates, six 1X2 plates and two of the new 1X1 round tiles (Element ID 6047015 | Design ID 98138). When Tim J asked which sets I would like to review from a list, one of the reasons I chose this set was two Technic pieces. Neither are new but both are comparatively rare. 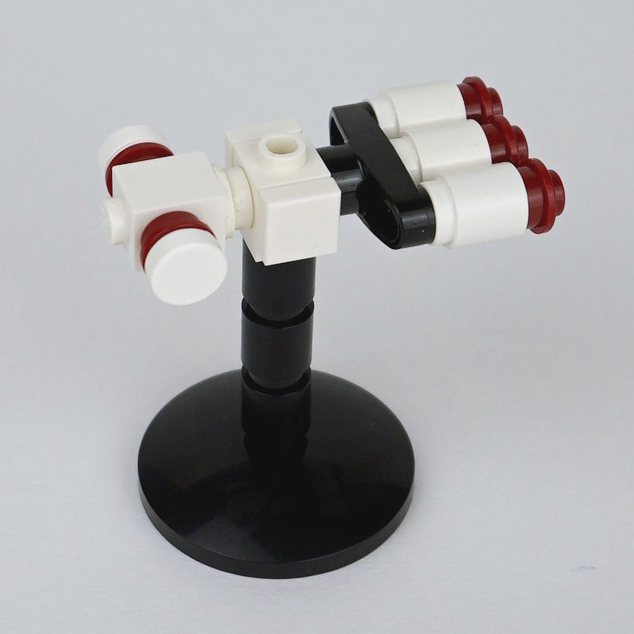 The three-long Technic connector with 2 pins and centre hole in black (Element ID 6055630 | Design ID 15461) has only been in 42021 Snowmobile before, but is suddenly in loads of sets just released. It strikes me as having all sorts of possibilities, not least a micro Star Wars frigate. The other piece is the weapon barrel in Light Bluish Gray [BL]/Medium Stone Grey [TLG] (Element ID 6039505 | Design ID 98585). First seen in the most recent UCS X-wing, I’ve been waiting to get hold of this nice textured piece for ages. Perfect for Building the Future. Does anyone collect Zamor spheres? If so you will like what I make to be the 27th colour variation so far (Element ID 6075599 | Design ID 95753), and rather nice it is too. The brand new flame piece with bar at top and bottom (Element ID 6083865 | Design ID 16768) looks rather useful and appears in seven sets in this wave and the flame-printed 1X1 round tile (Element ID 6074926 | Design ID 98138) should keep any pyromaniacs happy. Retro aviators will certainly be happy with the Dark Red [BL]/New Dark Red [TLG] engine piece (Element ID 6024071 | Design ID 4868). The little catapult looks a bit odd to me in the Light Aqua [BL]/Aqua [TLG] shade, would White not have better conveyed snow and ice? Anyway the 75° 2X1X3 slope (Element ID 6027624 | Design ID 4460) is new. Various pieces not previously released in Trans-Light Blue [BL]/Tr. L. Blue [TLG] appear across the range and this set exclusively has two of the palm leaf with clip (Element ID 6052986 | Design ID 10884). Also noteworthy are the left leg and right arm in this icy colour. New Elementary is intrigued by these new trans limbs. We’ve had trans heads and hook hands before, but never limbs. Can we expect to see a full trans hologram/ghost figure soon? The polycarbonate used to make most transparent parts is tricky stuff, it shatters much more easily than ABS and can stick to itself which is why you should never put a trans bar in a trans round 1X1 brick, for example. But as trans limbs are a new introduction does this mean LEGO are using something new? It was time to deploy science to find out. The following spectrum is an FTIR (Fourier transform infrared spectroscopy) scan of a trans arm from this set and it shows that it is indeed polycarbonate. There are a few minor differences from pure polycarbonate, but this is probably whatever has been added for the colour. It looks like official fully trans figures are not quite with us yet. 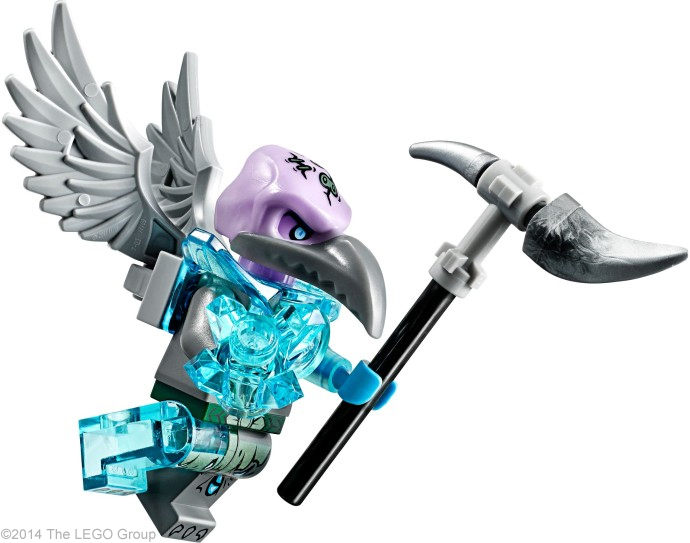 There are various other new minifig related pieces as well which you can see in the pictures, some of which will be discussed in future Chima posts. But surely the most exciting piece so far this year is the 1X2 plate with angular extension and flexible tip in Dark Green and Orange [BL]/Bright Orange [TLG] (Element ID 6074624 | Design ID 61406). I look forward to seeing them all over Flickr in many and various MOCs. 70135 Cragger's Fire Striker retails at GB£34.99 / €39.99. At time fo writing it is yet to be released in the US. All images © Tim Goddard except where otherwise indicated. As you wisely point out, the problem with transparent polycarbonate is that it sticks to itself. A transparent minifigure arm or leg doesn't indicate the possibility of a fully transparent minifigure any more than the transparent minifigure heads that have been available for two decades and have frequently been used for minifigures. Unless the torso, hands, and hips that they're attached to start to appear in transparent colors, there's no indication that anything has changed in that respect. I'm a bit surprised and somewhat disappointed that the claws in this set are Tr. Bright Orange and not Tr. Fluore. Reddish-Orange, but that's largely personal bias (there are more Hero Factory parts in Tr. Fluore. Reddish-Orange, so that color is generally more useful to me in my own models). It is VERY cool to learn that you were involved in a development workshop for Legends of Chima! I didn't even know that any AFOLs were involved in that theme's development. It must be an amazing experience. I hope I can be a good enough builder to be invited to LEGO headquarters one day. I actually like the use of Aqua for the ice structures in this theme. It better matches the Transparent Light Blue of the villains' icy limbs and armor, and better contrasts with the fiery colors of the heroes' vehicles and costumes, than White would have on its own. Glacial or arctic ice can actually appear bluish in certain conditions: see here. I didn't realise that transparent parts can stick. Does that mean my Robie House is in peril if I leave it constructed too long? There are lots of 1x1 clear plates stacked together to make the windows. I think that only holds true for illegal connections. Several of my old trans pieces look shattered, though, even if they mostly work fine for building. It's not a case of illegal connections, but certain connections are tighter and shouldn't be used with two polycarbonate parts. Stud-to-stud connections are fine, but have you ever tried attaching a lightsaber blade inside a transparent 1x1 cone? If you haven't, DON'T: the two are notoriously hard to separate. Minifigure parts are designed with higher friction in mind, to better facilitate posing. With that in mind, Lego can continue to produce transparent arms, but creating a transparent torso or transparent hands is a no-go. And that makes me wonder... would attaching one of the transparent arms to the polycarbonate rock monsters from Power Miners accurately simulate the kind of issues that would occur with a transparent arm and normal transparent torso? If I ever have extras of both parts that can be sacrificed, it may be worth testing that... for science! There are two sets of issues with trans parts. Older trans parts were not made out of polycarb (acrylic, from what I've heard) and were prone to fracturing. The 1x1 round plate was particularly fragile, as the internal geometry was a true circle and even the _slightest_ tilt when removing it could blow out one of the sides. New trans parts are polycarb, which is a much less flexible plastic than ABS. While this isn't an issue with basic bricks and plates (the walls do flex enough to allow fairly easy removal), bars tend to bind in anything that has a perfect-circle hole (1x1 plate w/ headlight is an example of a part that has a faceted bar-diameter hole, which doesn't bind as much). It's not that the parts are fusing, or reacting in any chemical manner. It's that the part tolerances were planned for a plastic that would flex a bit more and it makes the connection a bit too tight for a more rigid plastic. How can one join the CEE? I sometimes post new piece pics to my Instagram, although pics of my pets and animals sighted on hikes and such dominate my Instagram. Anyway, I'm really excited for these new Chima sets, as I really only collected the Speedorz (particularly the Ring of Fire set with its eight Trans-Orange 1x4 Hinge Bricks which, up until now, has been in only the Ring of Fire set, but now appears in the Summer 2014 set Inferno Pit, albeit with just 2 of them). One reason I'm excited is because I'm a big transparent piece collector... Those trans-light blue palm leaves look so awesome! When I first saw the Mammoth, I immediately added it to my MUST BUY list, just because of the transparent pieces. Have you tried the Ultra Agents sets yet? Not sure if they are available in the UK yet, as I'm in the US and we've had them available since June (or earlier). They come with many nice pieces and I'd be happy to list a few interesting pieces for your reviews of the sets. The CEE is a department within The LEGO Company. You can't just "join" it. They do have programs developed to support the AFOL community, but not on an individual basis. Your best bet for getting any support is to join an established LUG that has already qualified for such. When Jek-14 was released, we were informed that we should never expect a full trans minifig because of how fragile some of the parts would be. Polycarb doesn't have as much flex as ABS, so the torso would be prone to splitting below the arm holes, and the pins on both the hips and hands would be much easier to break. If we're ever going to see any Jedi spirit minifigs, look to the LotR corsair ship's Army of the Dead trio for ideas on what they might look like. Besides, the deco would probably look much better on an opaque ghost-appropriate shade than on any trans colors. On the trans-orange vs TNG issue, I can't really figure out why they even keep both on the current color pallete. I've heard that they have implemented a strict limit on the number of colors available each year, and that to add a new color they have to drop one to make room. Why they'd keep two such similar shades on that list while dropping more unique and very popular colors is just mind-boggling. And as for the two-tone spike...I actually loathe that part with every inch of my body. When it first came out, my main critique was that the blending of the two colors/materials was always lopsided, so when a double-black part was released I was all excited to be able to put it to use. Then I actually played around with it, and determined that it doesn't blend nicely into other shapes, and that if I was going to have something jutting out I'd much prefer a more interesting and tailored shape. The two most likely reasons I can see to love that part are if someone is infatuated with all-things-anime, or if they seek justification for building in odd color schemes. Just curious as to what's wrong with a full-trans minifigure. I'm writing this in the knowledge of what I have read in the preceding comments, so if I misunderstood anything, my apologies in advance. 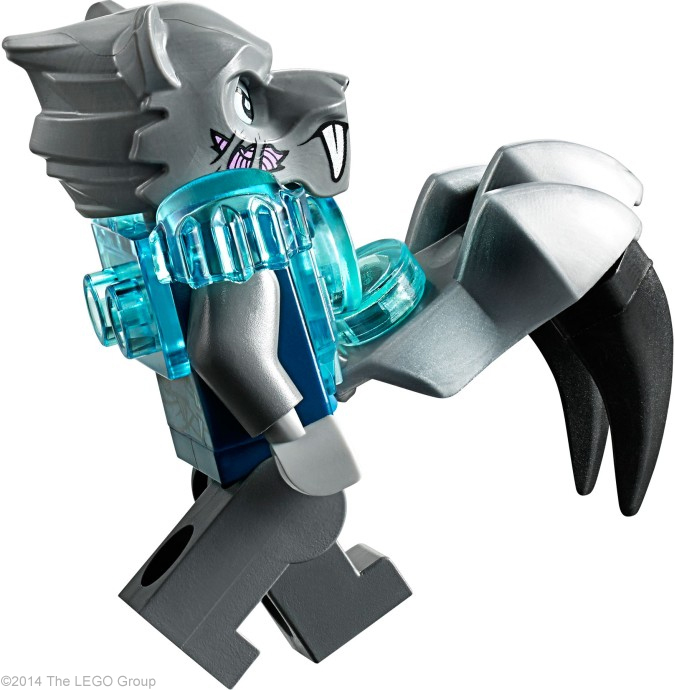 Knowing that we can't expect connecting parts to be of the same kind of plastic (ie, arms to hands to torsos, etc), I feel that the trans-light blue and trans-medium blue arms LEGO have made so far (medium blue arms are on Elektro from the Spider-Trike set, which is a clear difference from the trans-light blue of Jek-14), are sufficient enough to pass for that color. With the legs being made of, what, Poly, it shouldn't be much of an issue with making transparent hips out of the same plastic as the arms, as hips are relatively small and not seen so easily, and I'd be happy with that. As for clear heads to clear torsos, from what I understand, they'd stick together if left together for long periods? If that's true, explain the Alien Conquest alien minifigs with the clear green heads and the clear green brain headgear that get attached to those heads. The key is, how long is a "long period of time" that is long enough to cause the "sticking together" of the pieces? If that time is an hour, then yeah, that WOULD be a problem; if the time was on the order of years, then it should not be a problem as most kids and AFOLs probably disassemble and rebuild their sets many times over a year or two. As I mentioned at beginning of post, please do correct me if I'm wrong. The issue with trans on trans is an old one and people above have covered it well. Two pieces like a couple of trans 1x1 plates will never stick together, it is only high pressure connections like a bar in a 1x1 cone (or an arm in a torso) that cause issues. Go and try it (carefully, I'm not responsible for any cracking that may occur!). I have a rough of idea of why this happens but I'm an analytical chemist not a materials physicist so I won't go there. There are not that many alternatives to polycarbonate for trans and I'm sure Lego have looked into those that exist and found them wanting in other ways (softness for one). I've actually never had an issue with any trans on trans connections. Like you say, it's only high-pressure connections. Perhaps there could be some sort of naturally-based additive that could be added to the plastic before it is molded that can increase the softness a bit (not too much) to the problematic plastic. Perhaps this might solve the issue of removal or cracking or whatever the issue is? Of course, we might have to defer to someone who actually knows about materials (of which I'm not one). But I do typically like to help find solutions to common problems. _ALL_ current trans parts are made from polycarbonate. There's no difference between the stuff used to make Jek-14's arm, or the trans Chima legs, except perhaps color. So there's no way to just swich to a different trans material for connecting parts. Besides, if the theoretical new plastic is just as rigid as polycarb, it wouldn't solve the core problem, which is that the trans plastic is just too rigid and prone to breaking when subjected to stress that ABS can handle just fine. As for additives, that's what they do with Styrene to get ABS, which gives exactly that effect. Doing that for a trans plastic, however, would only be possible if you could find an optically clear rubberizing agent, _and_ have it be something that blends nicely with polycarb. That's a lot more difficult than it sounds. I can definitely understand why there are two transparent colors on the palette, because they look very different. Tr. Fluore. Reddish Orange (Trans-Neon Orange) is, as the name implies, both more fluorescent and more reddish than Tr. Bright Orange. It's great for things that are meant to glow like spaceship engine lights, not so great for things that are meant to look "glassy" such as windscreens. It can be frustrating when parts exist in one and you want them in the other, though. But if you're going to raise complaints about transparent colors that look too similar, there are so many better things to complain about. There are three transparent green colors (Tr. Green, Tr. Fluore. Green, and Tr. Bright Green) and three transparent blue colors (Tr. Blue, Tr. Light Blue, and Tr. Fluore. Blue) on the current palette. With that said, I have never heard mention of any rule saying new colors having to replace an old color on the palette. No existing colors were removed from the palette when colors 321–326 were added. There is a rule somewhat like that for LEGO elements (part+color+decoration), though. But how many things do you see orange windscreens on _besides_ spaceships? And in those cases, most Space builders I know would rather have all parts in a single shade of trans-orange, not two. The difference between the three greens is very obvious, but the two lighter shades of blue (one of which many people do not realize will glow under blacklight) is another odd situation. I don't know where I read it, but I remember reading that the set designers had been notified that they had a finite number of molds they could use (and to add one means to get rid of one), and that they had a finite limit to the yearly color pallete. There's certainly a warehousing issue if they decide they want _everything_ in _every_ color available at the same time, but mold storage is also an issue, and while color variety is no longer affected by needing to have several shades of resin pellets in stock, I know they do keep a sample chart of what colors are available each year. It was reduced drastically about ten years ago, and has not ballooned back up to its old size since then, so they're clearly trimming out old colors to some degree.